Are you interested in science and do you love the sea? Then get to know what marine science is all about! Visit our SouthBaltic Weblab to learn more about the open questions oceanographers are working on! You are welcome to try out their methods and experiments in our virtual lab and to experience real field work during our annual science camp! Meet scientists through our website and in your neighbourhood and follow their daily blogs. Besides, it is always worthwhile to visit our website to find information about vacancies and internships. This year's Science Camp was finished with great success according to opinions of participants as well as organisers. 100 students from Denmark, Finland, Estonia, Poland, Lithuania and Germany met in Kappeln at the Schlei, Germany, to attend both scientific and hands-on workshops about the Baltic Sea. 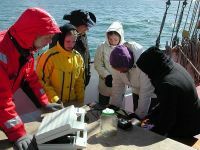 They also took their own scientific samples on a working boat. The Science Camp was organised by the Baltic Sea project Denmark. Read the blog to see what happened each day or visit the gallery to get more visual impressions! You can also go to the archive to get an overview of all previous Summer Science Camps. With heart and mind committed to the sea: marine scientists report about their work in a new series of blogs. The blogs offer a look behind the scenes of marine science, a firsthand account of the job. They are also an opportunity for young people to contact the scientists directly and ask questions. The first to write about her work is Natalie Loick-Wilde. She is a marine biologist, whose speciality is the marine nitrogen cycle. As one of the most important cycles, it is essential for life in the ocean.